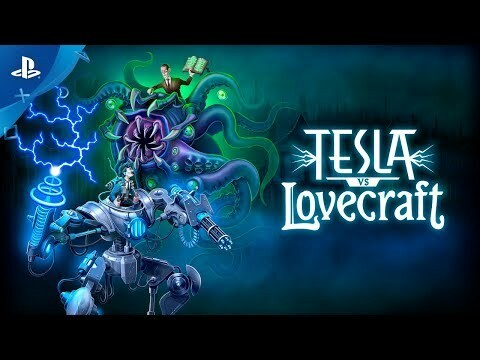 Tesla vs Lovecraft is an explosive twin-stick shooter where science and tentacles clash! Tesla vs Lovecraft is an intense top-down, twin-stick shooter where the player takes on a relentless assault of nightmarish monsters and abominations. Play as genius inventor Nikola Tesla and show the inhuman minions of horror author H.P. Lovecraft science is not afraid of anything! At the unveiling of scientist Nikola Tesla’s greatest invention, horror author H.P. Lovecraft storms the stage. He claims Tesla is playing with forces he can’t comprehend. Lovecraft is swiftly escorted out, but as Tesla’s laboratory is burned down the following night and inhuman creatures are seen skulking about, it is clear an epic clash of reason and madness is about to begin! Quantum Teleport – With Tesla’s Quantum Teleport backpack, you can instantly teleport a short distance even through solid objects. Equally useful in evasion and assault! Tesla-Mech battle robot – Collect six parts to activate the Tesla-Mech, a high-tech battle robot with immense firepower. Shred monsters with twin miniguns, or dash through them and crush them like ants!